I painted these cute mary janes using a photo that my talented friend Kel took for me. I have been making personalized note cards for little girls using this image on the front. I gave the original to my little friend Phoebe when she turned one. 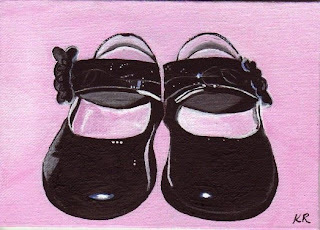 What is prettier than a little pair of black patent mary janes! !